Simon Pagenaud just completed an accomplishment this past Saturday - and that is a win in an oval track. 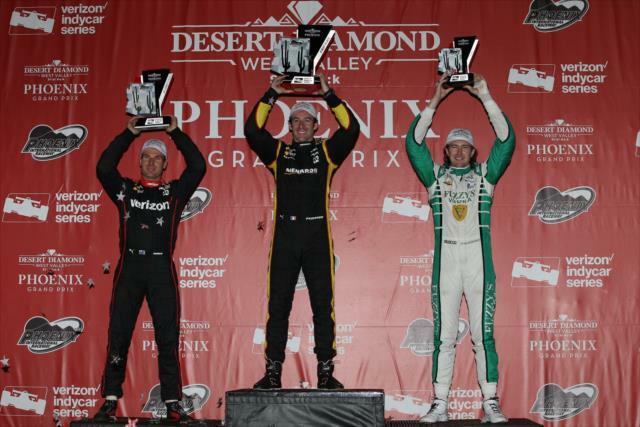 And it took 105 tries for Pagenaud to win the Desert Diamond West Valley GP at Phoenix with a 1-2 for Team Penske as Will Power scores his 1st top 5 and a 2nd-place podium finish. The best surprise of the night goes to Ed Carpenter Racing driver JR Hildebrand who finished 3rd. It is his 6th top-5 finish and his 1st podium since the ill-faded finish at the 2011 Indy 500 where he crashed in the final turn on the final lap. Polesitter Helio Castroneves came to finish 4th with Scott Dixon surging to a 5th Place finish followed by Tony Kannan in 6th. Owner/driver Ed Carpenter wasa the biggest mover of the race up 14 postions after starting in the back for a 7th place with Charlie Kimball right behind him. Josef Newgarden's night was a blistering one after snapping 2 front wings would settle for 9th. Carlos Munoz provided a best result for AJ Foyt Racing completing the top 10. It was another downer for Andretti Autosport. And for the 2nd time, all drivers failed to finish. Marco Andretti was nudged by Ed Jones right after Mikhail Aleshin spun in the initial lap collecting the series leader Sebastien Bourdais. The incident also collected Max Chilton and Graham Rahal. Alexander Rossi met the turn 4 wall for the 2nd straight year bending his suspension. Takuma Sato also met the turn 4 wall as is Ryan Hunter-Reay before Newgarden damaged his rear wing assembly. Ryan's night ended after 220 laps. Pagenaud would leave Phoenix as the new series leader with Scott Dixon, and Josef Newgarden in the top 3. Bourdais drops 3 spots to 4th with James Hinchcliff rounding up the top 5 as they head down to Indianapolis Motor Speedway for the Indy GP right before the Indy 500. We also like to send get well wishes to Michael Andretti's cousin John Andretti who is currently battling Stage 4 Colon Cancer after he was diagnosed in January. Mario's nephew is under chemo and will have surgery in June.